Happy June my friends! Are you already in full summertime mode? We are here! We’ve been enjoying meals on the back deck are planning fun activities for this happy season. For us, summer means move family movie nights so I’m excited to share this movie review and giveaway with you today. Steps of Faith movie is perfect for all ages, making it a great addition to your movie collection. I happily teamed up with Lev3l Digital to bring you this giveaway today. I will receive the prize pack offered in the giveaway to thank me for my time. No other compensation was given. All opinions are my own. 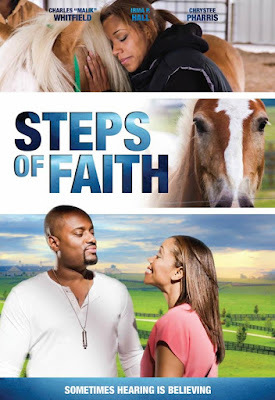 "Steps of Faith is a light-heart dramedy about Faith Houston an accountant, who is directed by God to move to a small town to work on a Hippotherapy farm helping children. Faith is mocked by her family since she doesn’t have a rapport with children or animals and is not a devout Christian. Faith decides to follow her heart and move after she encounters several challenges. She finds herself at the farm in the horse stalls shoveling manure. Faith cracks under pressure and leaves after a child is almost injured questioning whether she heard God’s voice or not." I liked the character Faith from the very beginning of the movie because she has a realness about her. Even in church, she isn’t afraid to say what she is thinking. More and more though, what she is thinking is there has got to be something else for her in life. She starts praying for and looking for a sign from God, any sign that will point her in the right direction. When she does receive her sign, she doubts it and asks for “one more sign’. Boy, have I been there more than once in my life! We all want to feel we are on the right path in our lives; so as Christians we pray for clarity and then we pray for more clarity because of our own self-doubt. Her praying leads her to move to a small town to work on a Hippotherapy farm (Hippotherapy means “treatment with the help of the horse” from the Greek word “hippos” meaning horse.) When she tells her family of her plans over Sunday dinner, they laugh at her because Faith doesn’t have much luck with kids, nor is she an active churchgoer. Her family points out the flaws in her plan, which leads her to more praying, but ultimately she makes the move to a small town without truly knowing how things will work out because sometimes hearing is believing! 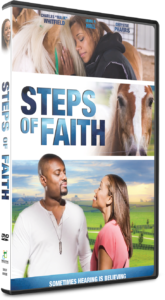 Here is the official movie clip, plus two exclusive bonus clips for you to discover more about Steps of Faith. You may have noticed that this movie has a mainly black cast, but this story isn’t about race or backgrounds, it’s a story of one ladies desire to find her place and purpose in this world. It doesn’t hurt that she finds romance along the way! Her struggles are real and it’s not all easy for our leading lady. In fact, she wants to quit when a child is almost injured. She questions God again, she questions herself again. Is her faith strong enough to keep her at the farm? Is Steps of Faith a little predictable? Yes. Does it have spots where the storyline comes off as cheesy or drags a little bit? Yes. I still really liked this Christian feel-good movie and plan on watching it with my family and I think you will too, so please be sure to enter our giveaway below and share it with friends and family who may enjoy this movie too. I invite you to learn more about Leaps of Faith, (which is available to purchase now) by visiting the website here and by visiting the movies Facebook page. Life is all about finding your place, your purpose, your voice, your calling from where you are standing. That road can change as you grow and mature and this fun film helps remind us all that through faith and perseverance nothing is impossible. Thanks to today's’ sponsors, Lev3l Digital, one lucky reader will receive a DVD copy of Leaps of Faith. Please share in comments: Are you or someone in your family a horse person? I live in Ky. So I love Horses. not to mention that I believe in faith and I know that faith is hard to earn and hard to keep. I really want to watch this movie and I thank you so so much for this chance! I love all animals, though I'd not specifically say I'm a horse person. This movie intrigues me, though, because just last week I reviewed a book about a woman who started a horse ranch to help hurting kids and rescued horses. Several similarities! I love all animals. I have never had a horse but would love to have one! Its very important to have faith and believe in faith especially in the world we live in today. This sounds like a great movie to watch with my family! When I was a child, we lived on a farm. I had a horse at that time. Loved him!! We do not have horses now, but I still love them! We've had horses on our farm before but right now we just have 3 miniature horses for our granddaughters. i am a horse person. I like horses. I would love to see this movie. I thank you for the chance! My daughter absolutely LOVES horses. Kentucky is such a beautiful state. I'm glad you found my giveaway and wish you good luck! Yay! I love animals too! Thanks for entering. Good luck. This movie and book do sound similar. Thanks for entering and good luck. My daughters do too. They are such majestic animals. Thanks for entering!